We made good plans and left the ski apartment early on Saturday morning: we needed to be in Munich to at 1pm to drop off the car. It went really well until about 30 minutes out from the airport. 1. the light snow fall started to become very much heavier and 2. our GPS, with maps from a few years ago, couldn't quite handle the major changes to the road layout and kept telling us we were in a paddock and should turn around now. We stopped listening to the GPS and and started following the actual road signs. By the time we got to the airport the snow was lying on the ground, but we felt relieved we were at the airport and on schedule. We were delayed about 90 minutes in boarding the airplane, and once on board we were told there would be a short delay because of the weather conditions. But were happy to be served a drink in the interim. THEN, the pilot walked out into the main cabin and used the public address system to say there was a backlog of 40 planes in front of us for de-icing and that it would take 6 hours for us to get to de-icing point, therefore the flight had been cancelled. We returned to the terminal and proceeded to participate in the most hideous customer service we have ever seen. In front of us were 100 people and 4 service agents. 3 hours later, there were still more than 50 people in front of us, and 400 behind us. Only then did Lufthansa start making public announcements that passengers should make personal arrangements for accommodation etc. This was 9pm, and by this stage all the airport hotels were full, so we made a booking in Munich city - 45 minutes by train away. We had also received an email saying we were booked on the same flight for the next day. As we were still in the international terminal we had to clear customs and go find our suitcases. After waiting in a line for 20 minutes at luggage tracking, they said they couldn't locate our suitcases and gave us an overnight kit, but told us to talk to the staff on the departures level. The lady there spoke better English and said our bags were OK and had been transferred to the flight for the next day. She actually gave us a EUR10 voucher each for a meal (which we used when we came back to the airport the next day). We took our hand luggage and took the train into the city. We got to our hotel just before 11 pm and we went down to the restaurant/bar of the hotel. We had not had any dinner while waiting in the chaos, but had been given a couple of Kit Kats and water. We went to order a soup each, only to find the kitchen had closed about 10pm. 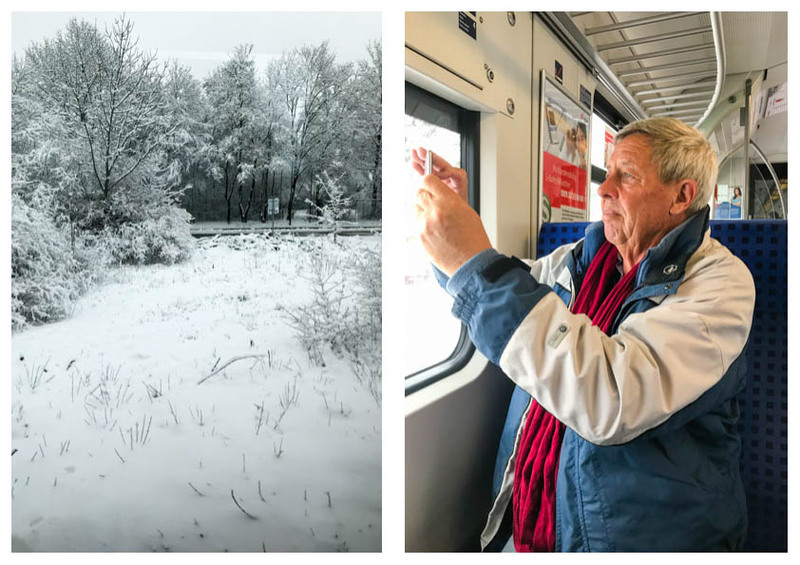 Rather dejectedly we returned to our room, put on the multiple layers of winter clothing and returned to the street and the snow, hoping we would not have to walk the entire way back to the train station - where most things had been closing as we passed through. The absolute highlight of the entire day was finding a Italian restaurant on the corner, where we purchased a couple of slices of Pizza. It was absolutely outstanding Pizza. It would have been fantastically good even if we weren't tired, cold and totally tired out by the day. The next morning we reversed our journey, took pictures of the snow and went through the whole international customs/immigration procedure for a 2nd time. 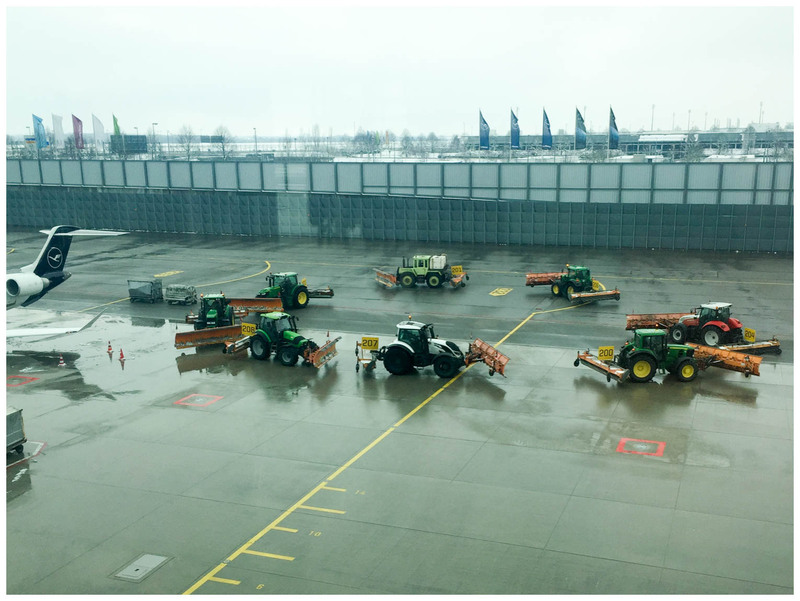 Today the fleet of clearance tractors were mopping up water and there was no snow on the runways. And our flight left as scheduled.